It barely ever fails. When Fermin needs to buy something, and I tag along, I'm the one that ends up finding stuff, and he doesn't. Or, if I'm the one needing to buy something, and he tags along, he's the one that ends up finding all sorts of stuff to buy and I end up with nothing. We LOVE Whole Earth Provisions! So last night, when Fermin needed to swing by Whole Earth Provisions to look for shoes, he jokingly said, "Ok, we're here for you, Kerri. "- thinking he could trick the universe, and he would actually be the one to find something great to buy, since he was, after all, the one looking. But the universe cannot be fooled, apparently. I wasn't really even looking for anything. In fact, I considered just sitting in the car and killing time because I was feeling so lazy, I didn't even want to have to walk into the store. I went in though, and I saw sale signs in all my favorite places in the store. And then found out there was an additional 25% off a lot of the things I was looking at. Reluctantly, I tried on a few pair of shoes. And a few t-shirts. Although I am not in need of any shoes, when I find a pair both cute and comfortable and marked way, way down in price, who am I to walk away from that?! And honestly, although I don't need any t-shirts either, I have been noticing lately, how few short sleeved t-shirts I have. I love the "Life is Good" brand, and they just so happened to be on sale. 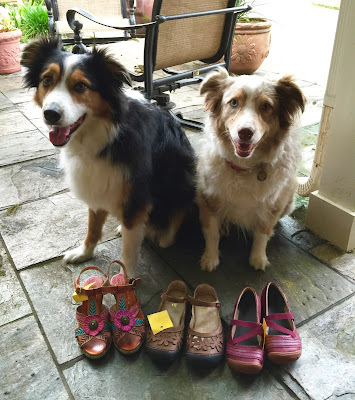 three pair of shoes, to walk 2 best friends! an up-close photo of my favs! Life Is Good, and Kuhl! It feels a little extravagant, buying all of these things during this unexpected splurge. BUT, if my calculations are correct, I actually saved more money than I spent.